Help Grosta at Heartwood Mill locate her missing husband. Talk to Grosta about her missing husband. Locate Leifnarr in Broken Helm Hollow. Return to Grosta for your reward. Heartwood Mill, a remote lumber mill located where Lake Honrich turns into Treva River, seems less busy than other mills with only Grosta working the mill and her son Gralnach fooling around on and off the road. If you talk to Gralnach, he will explain his father disappeared without a trace and left him and his mother alone with a mill to run. Talking to Grosta will reveal her suspicion that Leifnarr ran off with another woman and that she can't run the mill by herself. She then explains how Leifnarr left to trade wood and grain with some merchants near the Morrowind border, specifically a place called Broken Helm Hollow, and will mark the place on your map. When you arrive at Broken Helm Hollow, it quickly becomes evident that Leifnarr was set up, as two leveled bandits will guard the cave entrance. Dispose of them both and head inside then proceed down the narrow tunnel and into the main area of the dungeon. There, you will encounter two more leveled bandits around the fire, as well as the bandit chief who resides up the southeastern slope. The boss chest is unlocked, but beware the corresponding swinging mace trap. Locate and read the Two-handed skill book Battle Of Sancre Tor, then find the pull chain straight south from the first set of bedrolls. Pull the chain and watch the rock wall disappear. Inside lies the dead body of Grosta's husband with an arrow through his chest. The room also consists of several severed limbs and blood spatters, along with a random spell tome and a weapons rack with lower level equipment. Activate the body to get the quest update, then leave the cave. Once you travel back to Heartwood Mill, you will have no choice but to tell Grosta she is now a widow, which will make her regret her suspicions about Leifnarr being unfaithful to her. For bringing her closure at last, Grosta will reward you with a leveled enchanted weapon, and her thanks. As a result of her friendship, you are now allowed to take the limited supplies from her house without penalty. 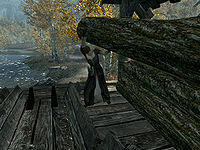 You may also cut lumber freely at her mill for your player-built house, if you have Hearthfire installed. Although she expresses sorrow when you tell her of her husband's death, Grosta's ordinary dialogue does not change and she continues to say that all men are pigs after this quest has been completed. 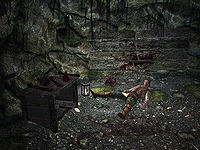 Leifnarr's body is unnamed, identified only by the generic title of "Nord". Enter SetStage E3EA5 20 into the console. This will set quest stage to "Find Leifnarr" and allow you to reactivate Leifnarr's corpse. You may then complete the quest normally. Enter CompleteAllObjectives E3EA5 into the console. This forces the quest to be completed. Killing Grosta will fail the quest and thus remove it from your journal. If Leifnarr's body is activated after completing the quest, the quest can be completed again, allowing an infinite amount of enchanted items to be acquired. ? On the PC, it is possible to use the console to advance through the quest by entering setstage FreeformHeartwoodMill stage, where stage is the number of the stage you wish to complete. It is not possible to un-complete (i.e. go back) quest stages, but it is possible to clear all stages of the quest using resetquest FreeformHeartwoodMill.